Today is Friday and that means garbage day and that means my dog is on DefCon 1. But for the first time in nine years, the trucks beeped and the men hauled but Stasia, she did not spring from the bed and race to the back door, barking for all she was worth. She didn’t even stand up in the bed and bark, as she has done on particularly cold mornings when she did not wish to leave the comfort of her carefully constructed nest of blankets. She lifted her head for a moment, gave a throaty little growl, stretched a wee bit and resumed her favorite sleeping position – inside spoon. Stasia is old. This is her birth month. She is ten. She got a hitch in her left hind leg a week ago and it is still bothering her. She gets winded faster. Her muzzle is almost entirely gray now. 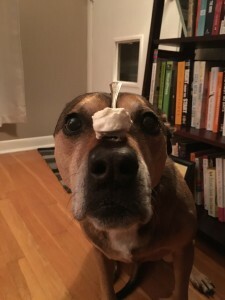 There are lots of stories running around the internet about dogs and how much we love them, stories about how devoted they are, stories about the endearing things they do. I’ve written a few of them. I’m not sure I would be alive if it weren’t for my dog. See, when I was diagnosed with cancer, I was single. It was me and the dog, alone in this house. A few weeks into treatment, I couldn’t reliably leave the house on my own. A few weeks after that, I couldn’t reliably leave my sofa and then, shortly after that, I couldn’t reliably leave my bed. Stasia never left my side. When I became too sick to take her out on her daily walks, family and friends took turns, dropping in to care for her. It was comforting to know there were people who gave enough of a damn to do that kind of thing. What was even better, though, was having visitors every day. My dog got taken out and I got a few moments of human interaction when I really, really, needed it. My physical recovery as been on a mostly upward trajectory, with notable regressions from time to time, the emotional and psychological recovery has not. For a very long time, I could physically get out of bed, but I didn’t want to. But there was Stasia, needing me, needing to be taken care of. And so, I got out of bed and stood in the sunlight. My cancer came at a bad time, like there is a good one, for my daughter and I. We were beginning that delicate phase of almost-quasi adult/parent renegotiation that happens when they leave home. My daughter, forever the most stubborn individual I ever met, was ready to move on, develop her own sense of herself and the world, invested in not needing me and not being needed. And then I was sick. And she was terrified. And she still wanted to be free. A lot of medical science and ingenuity and genius and invention has gone into my treatment. A lot of cold, hard, facts have been analyzed and conclusions deduced. But ask any oncologist why one tumor responds to a treatment and another doesn’t, why this person does well and that one doesn’t, and you will get a lot of words about the intangibles. Stasia is one of my intangibles. Being needed, feeling useful, it is powerful. Stasia and I, we take care of one another. I feed her good food. I play with her. 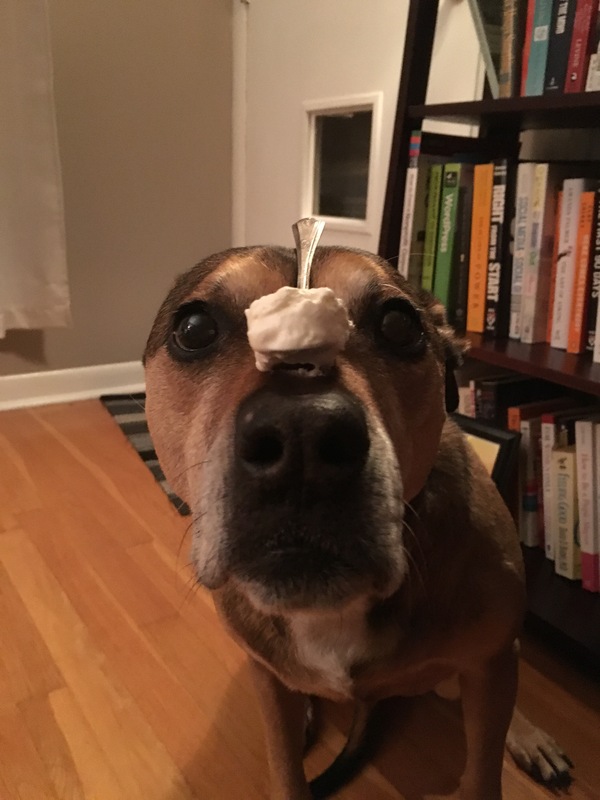 I put spoonfuls of homemade whipped cream on her head. I take her on car rides. I carry her poo in small bags in color-coordinated bags. In return, she gives me a wet nose in my ear if I sleep too late. She gives me reliable foot-warming during Netflix binges. I get enthusiastic tail thumping and licks on my return to home, whether my absence was two hours or two weeks. She loves me when I am sick and when I am well and when I am having a good writing day and when I am not. I know this will not go on forever. I know medical science is such, I may outlast her. I can’t think about that this morning, though. This morning, I am going to celebrate the first decade of Stasia’s life and plan for our next adventures.